This semester, I’ve had the opportunity to intern with the Smithsonian Institution Archives to help develop a program to connect teens with history when they visit the Castle. We chose to create two dimensions of the program. One part will consist of having twenty local teens who will be volunteering this summer. The second part will be developing an interactive game or experience to involve and excite younger visitors about history overall, as well as the history of the Smithsonian. From the beginning of this project, we knew that we were going to have to make sure that whatever we came up with connected with our targeted age-group. So, our team decided that before we made any specific decisions about what this experience was going to be, we would want to get input from teens about what they would actually want to participate in. Our first step was to do some background research, observations, and informal surveys about the types of young people visiting the Castle and to see what teens thought about the space. We learned that most of the younger visitors were there either with their parents or on a school trip. 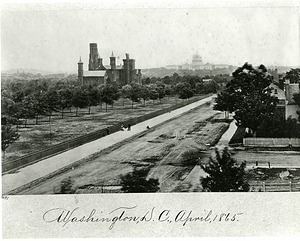 Everyone was curious about the architecture and why there was a castle on the Mall in Washington, D.C. 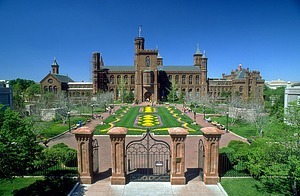 Very few people knew the history of the building or anything about the origins of the Smithsonian. Next, we decided to hold a workshop for local teens to help us get an idea of what they would actually be interested in. We used a Human-Centered Design Workshop format, which emphasizes a creative approach to problem solving. The process really focuses on the people you’re designing for, and ends with solutions that should be customized to those people. We had a great turnout of eighteen teens and spent the day teaching them about Human-Centered Design, introducing them to the Castle and the history of the Smithsonian, and getting a closer look at what they would be interested in. The workshop went really well and the different groups overwhelmingly came up with scavenger-hunt and escape room type experiences. Our research continued by reaching out to other local institutions who have similar teen programs or who have successfully run interactive game experiences, like scavenger hunts or escape rooms. We found a great partner in Carl Rauscher, who works as a game-developer at the U.S. National Archives. He’s run two successful escape room events and is a master storyteller. We learned that having a great storyline is one of the keys to success in creating an experience that really connects with your audience. We decided to hold a second workshop where we had teens develop possible storylines and Carl proved to be even more helpful. With his instructions and questioning, the teens came up with two different scenarios that could play out in an escape room type setting. The teens developed the storylines and even crafted a number of clues that could eventually go into the game. Today, we are working on developing the details of the storyline and game mechanics. Then we will begin piloting the game in early July. The teen volunteers will help facilitate the game as we test it through the end of summer. Stay tuned to learn more as we continue this exciting process!